1. Lie on your back with knees bent and feet flat on the floor. Lock your hand behind your neck and slowly lift your head toward your chest hold for 3 second. Do it 3 times a day. 2. Sit up straight in your chair tucking your chin slightly, Tilt your head to the left with your left hand on the upper right side of your head gently pull your head to the left hold for 3 second and repeat that on the right side. 3. 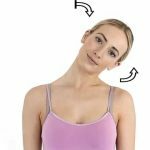 Sit up straight in your chair tucking your chin slightly, rotate your head to the left side with your right hand gently push your head to the left side hold for 3 second and repeat that with head rotation to the Right side. 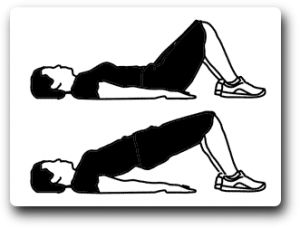 Lie on your Back, keeping both knees slightly bent .raise your left leg off the floor as far as you comfortably can. Wrap a towel behind your left knee or calf. 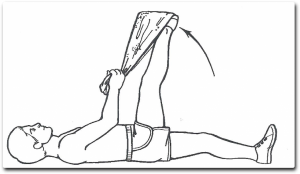 Hold both ends of the towel keep your leg straight and pull it toward your chest. Hold it for 3 second and repeat on the Right side. Stand up and place your left hand against the wall. 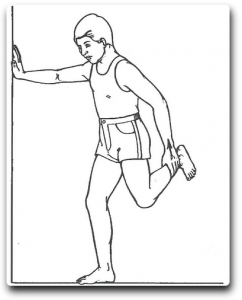 Hold to your right ankle with your right hand and gently pull your left leg straight hold for 3 second and repeat on the other side. Lie on the floor with your back flat and knees bent .keep your palms and feet flat on the floor. 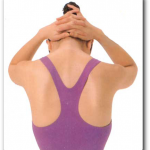 Tighten your stomach and your buttocks muscle and slowly lift your hips off the floor. Raise your hips high enough to straighten your lower back. Hold for 3 second and repeat that 3 times every day or as Directed by Doctor.